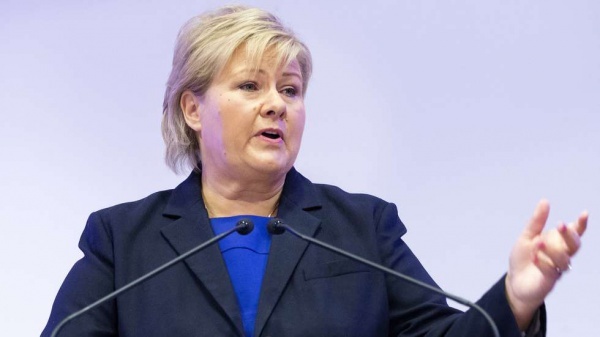 Norway’s Prime Minister, Erna Solberg has reportedly used a Hadith (saying) from the Prophet Mohammed (PBUH) in order to condemn the extremism of the Islamic State (IS) – an extremist group that has seized parts of Syria and Iraq- during a demonstration in Oslo against radical Islamists. During her participation, along with thousands of Norwegians from different religious and ethnic groups, in a rally against the Islamic State’s terrorism, Erna Solberg has reportedly quoted a Hadith- a saying or an act or tacit approval or disapproval attributed to the Prophet Muhammad- in her speech to condemn the IS’ radicalism. Mrs. Solberg went on to add that the huge number of Muslims who flooded the streets to condemn the radicalism of the Islamic State, “proves that the ISIS doesn’t represent Islam,” adding that she believes Muslims have always distanced themselves from extremism. On Monday, Norway’s prime minister and other politicians have joined Muslim leaders, as well as thousands of people from all walks of life for a demonstration against Radical Islam outside the Norwegian capital’s Parliament building. This huge demonstration came in a time after which Ubaydullah Hussain, a small group in Norway voiced pro-ISIS opinions, stirring controversy among the Muslim community in Norway. Anadoul Agency quoted the demonstration organizer, Yousef Gilani as saying that the march was arranged to show that Ubaydullah Hussain’s hate speech and support of the Islamic State was not symbolic of the country’s Muslims.